We are delighted to host the talented Geoff Hales again for our Christmas Event. 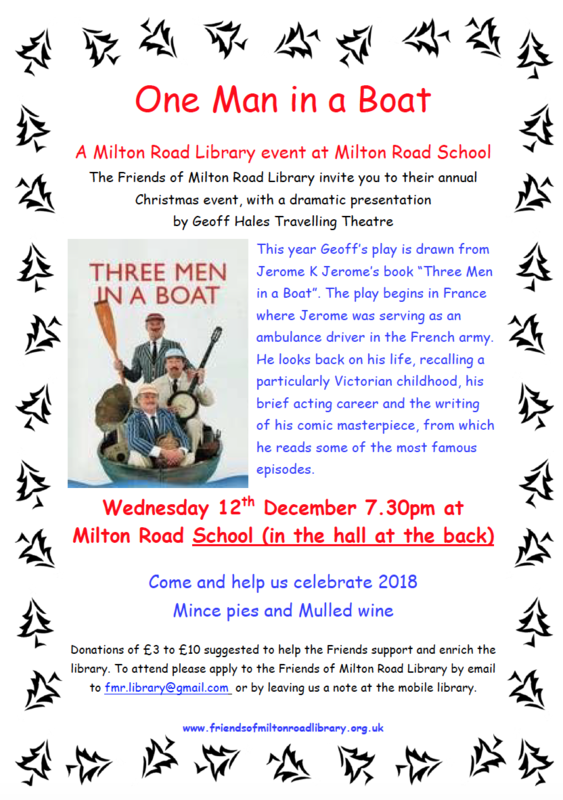 Join us to enjoy his play ‘One man in a boat’, with mulled wine and mince pies to share after. Based on Jerome K Jerome, the author of ‘Three men in a boat’, the play begins in France in 1915 where Jerome was serving as an ambulance driver in the French army. The play looks back on his life, recalling a particularly Victorian childhood, his brief acting career and the writing of his comic masterpiece, including some of the most famous episodes. Space is limited and these talks are ticketed. Please apply to the Friends of Milton Road Library by email to fmr.library@gmail.com or by leaving us a note at the temporary library. Tickets are free to current members of the Friends of Milton Road Library and £3 per person to non-members (payable on the door).